Cooling fabric is a new and innovative product in the textile industry that offers cool, comfortable, and soft texture next to the skin. Cooling fabrics are made of natural and synthetic textiles. They can also be worn by those who are sensitive to synthetic materials. Cooling fabrics allow consumers comfort by providing a cooling effect. They also help in evaporation of sweat and prevent the textile from clinging to the body. Important features of cooling fabrics include moisture circulation and regulated evaporation. Cooling fabrics aim to reduce the surface temperature of the fabric. These fabrics differ from other thermoregulatory textiles; cooling fabrics allow the fabric to cool down in high temperature conditions, while thermoregulatory textiles control the fabric temperature based on the surrounding weather. Typically, material and technology used by manufacturers of cooling fabrics are proprietary. Companies enter into collaborations with leading textile brands and facilitate their business through investments, technology licensing, and supply or contract agreements. Manufacturers of cooling fabrics often procure various types of fibers (synthetic or natural) and further process these with chemicals, additives, or cooling finishes. These fibers are then used in the production of cooling fabrics. Key players operating in the cooling fabrics market benefit from strategic alliances with global players. Many players have entered into partnerships with the leading clothing brands in order to boost their business through investments, technology licensing, supply or contract agreements, etc. Prominent players operating in the cooling fabrics market include Ahlstrom Corporation, Invista, Coolcore LLC, HexArmor, and Polartec. Manufacturers innovate products based on consumer requirement. For instance, smooth and cooling fabrics are used in the production of pillows, mattresses, beddings, etc. to improve the sleeping comfort of consumers. Similarly, medical applications of cooling fabrics are increasing. These fabrics are employed in on-the-go cooling pads, surgical gowns, scrubs, etc. Industrial applications of cooling fabrics, such as protective clothing used in mines, are likely to offer opportunities to the cooling fabrics market. Some players provide specialty fibers that are used in the manufacture of cooling fabrics. These players can forward integrate their business, although this entails technical expertise. Manufacturers can also expand their business by offering more than one cooling technologies to their business partners and consumers. Manufacturers of cooling fabrics can expand their production facilities in countries and regions with high growth potential. They can also increase their sales and distribution networks across regions where they lack presence. Such undertakings are likely to boost the market share of manufacturers in the global cooling fabrics market. The cooling fabrics market has been analyzed by dividing it into different segments: product, textile type, technology, end-user, and region. Based on product, the global market has been bifurcated into natural and synthetic. Synthetic segment has been further categorized into nylon blend, polyester blend, polyester, and others. In terms of textile type, the market has been classified into woven, non-woven, and knitted. Based on technology, the market has been segregated into cooling finishes, polymer coatings, specialty fibers, and others. Based on end-user, the cooling fabrics market has been split into lifestyle, protective clothing, sports apparel, medical, bedding/mattress, and others. 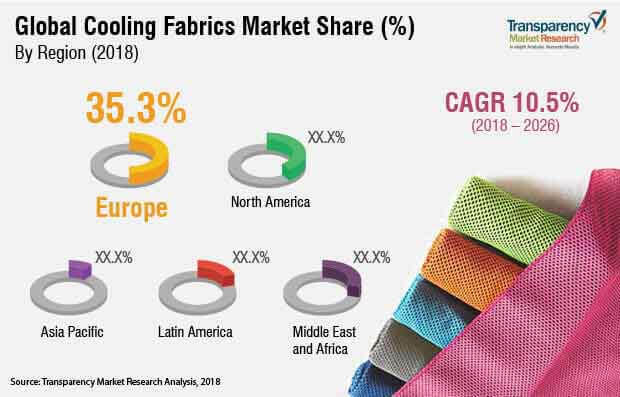 In terms of region, the global cooling fabrics market has been divided into North America, Europe, Asia Pacific, Latin America, and Middle East & Africa. Europe was the leading region of the cooling fabrics market in 2017. It was followed by North America. Demand for cooling fabrics is concentrated predominantly in sports apparel and lifestyle products such as active-wear and work-wear. Demand for cooling fabrics in Europe is high in the EU-15 countries such as Germany, France, and the U.K. However, China, Japan, South Korea, Singapore, and India are likely to offer higher growth potential for the cooling fabrics market in Asia Pacific. Led by the U.S., demand for cooling fabrics in North America is projected to rise during the forecast period, particularly in end-users such as sports apparel and protective clothing.